We’ve had great success displaying our teacher wish lists on a three-dimensional display. 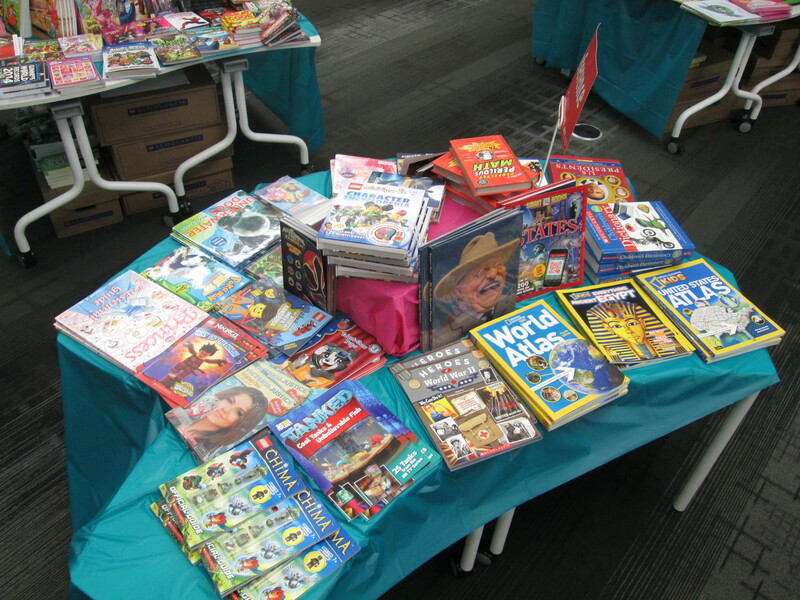 Book fair is such an important part of our library. 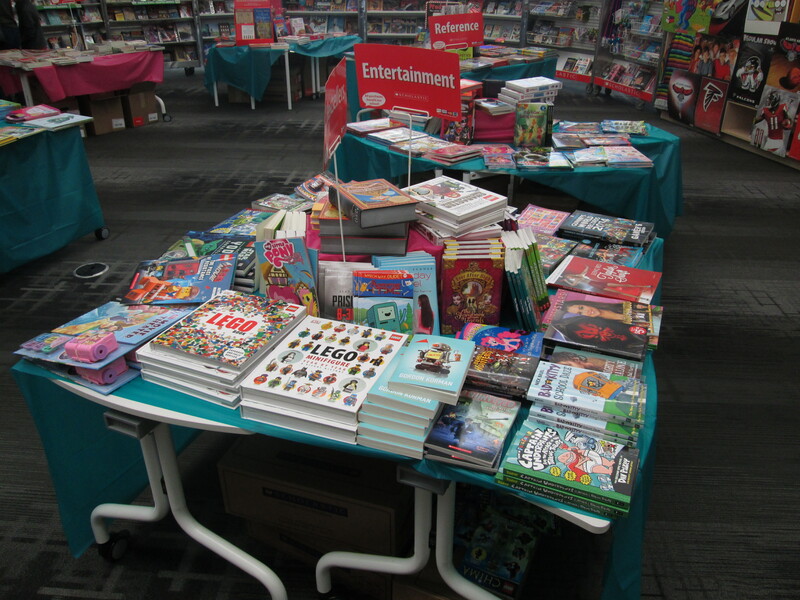 I love seeing the energy that book fair brings to our teachers, families, and students. 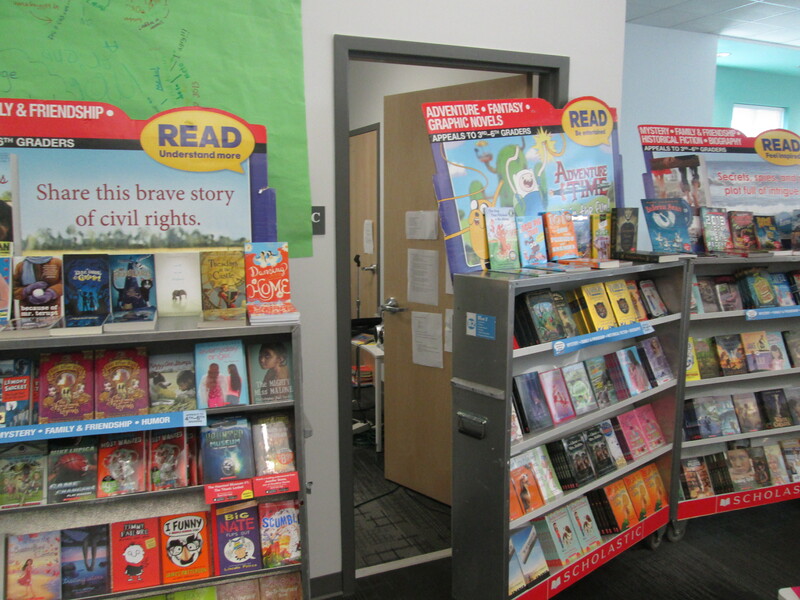 Everyone loves to come and see what new books are at the book fair each time. 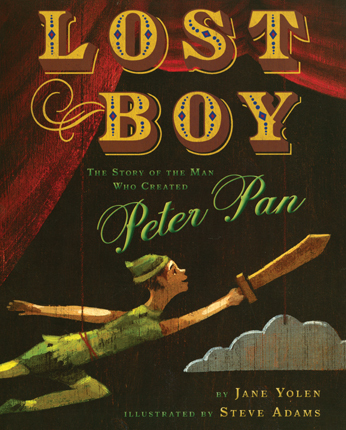 It gets new books into the home libraries of our students, and our wonderful PTA helps make sure that every student who wants a book gets one. Book fair also extends our yearly budget. 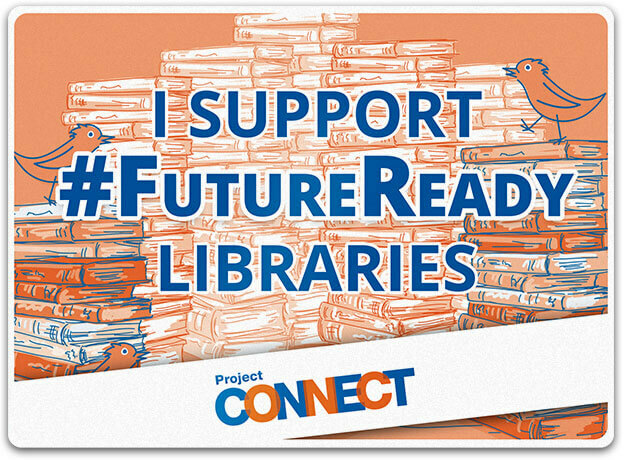 Our student book budgets, 3D printing supplies, author visits, and many other things are supported by the funds raised at our book fairs. In the past, book fair pretty much shut the library down as far as student checkout goes. 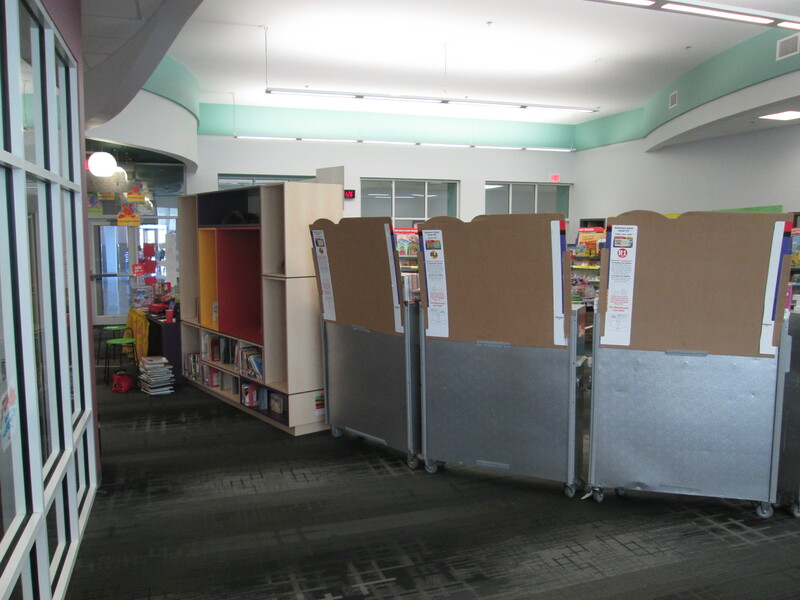 Because of our space being smaller and not flexible, the book fair cases blocked the shelves of our library. 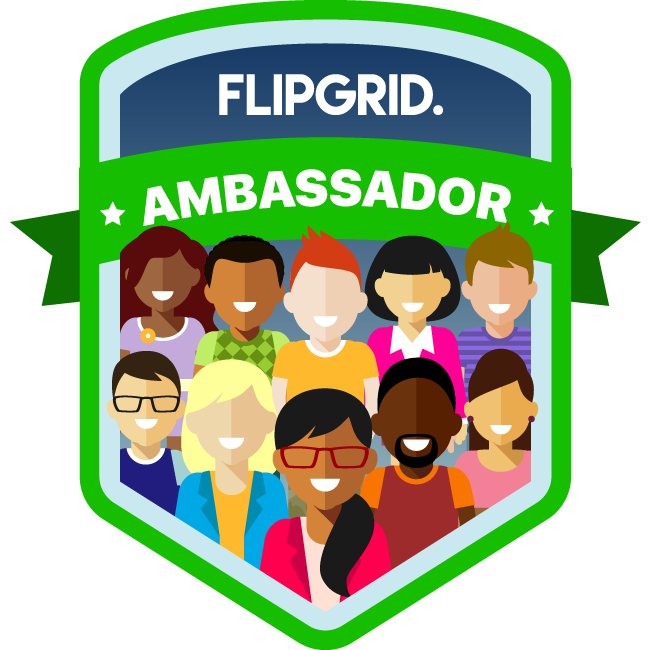 Since I had a paraprofessional in the past, I continued to teach classes, but checkout stopped for a whole week. 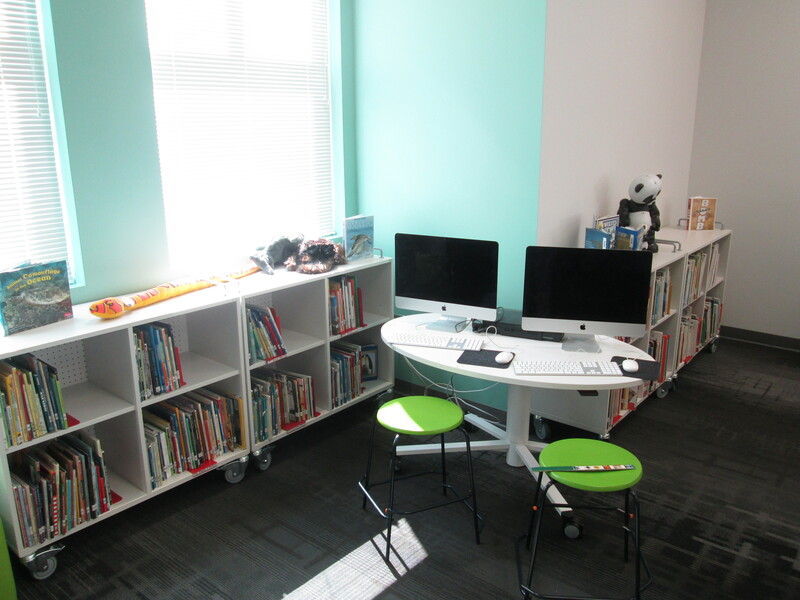 Now that we are in our new space, our library is 100% accessible to students, teachers, and families thanks to our flexible design. 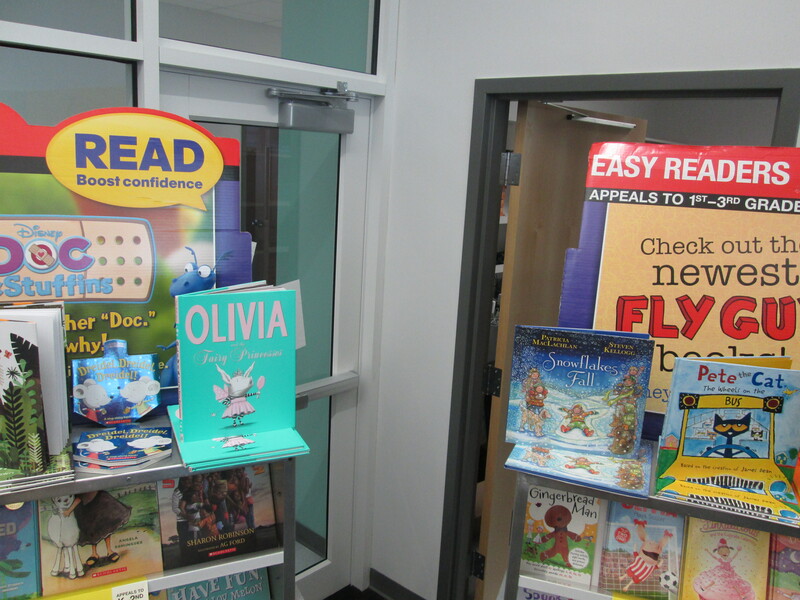 Our class schedule does slow down during book fair week since I pretty much run book fair by myself without a paraprofessional, but our wonderful parent volunteers step in and help when there are classes and projects that I need to continue with during book fair week. 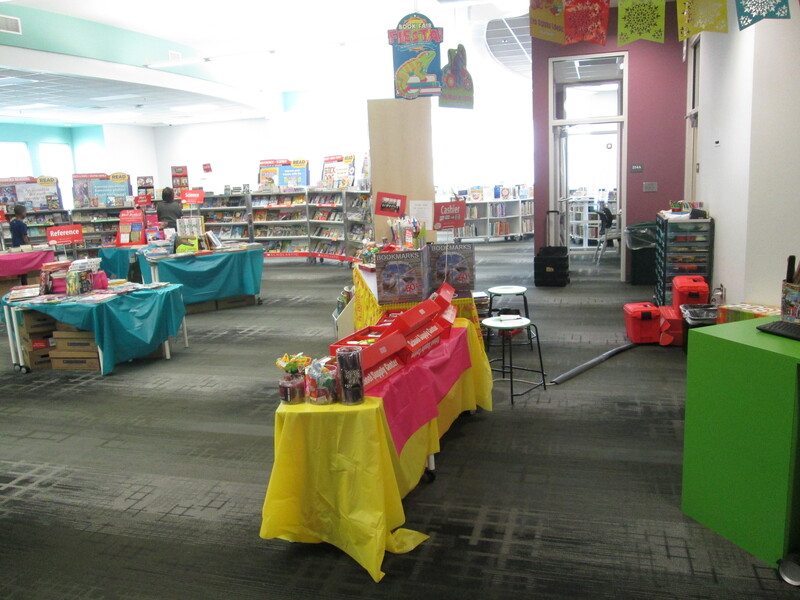 Here’s a look at how our space transforms during book fair. 1. 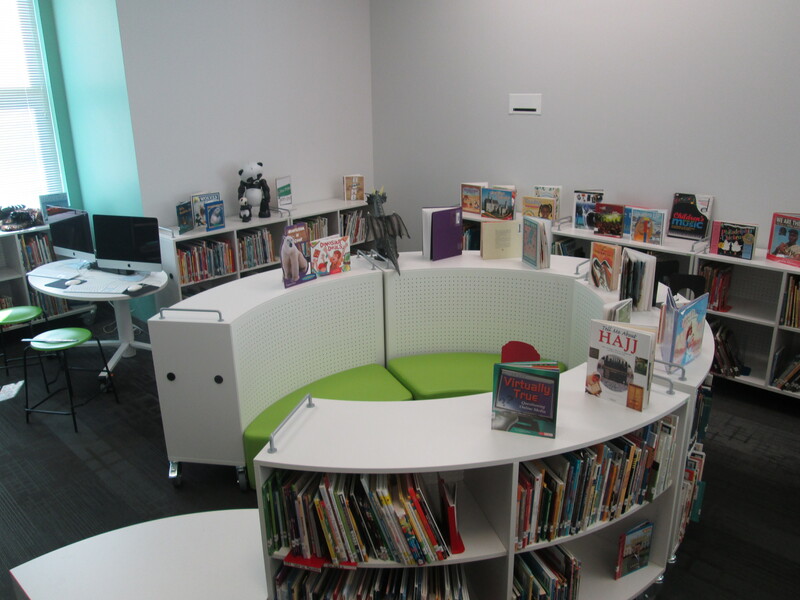 Our circulation island stays completely accessible with storage underneath for books that need to be shelved. 2. 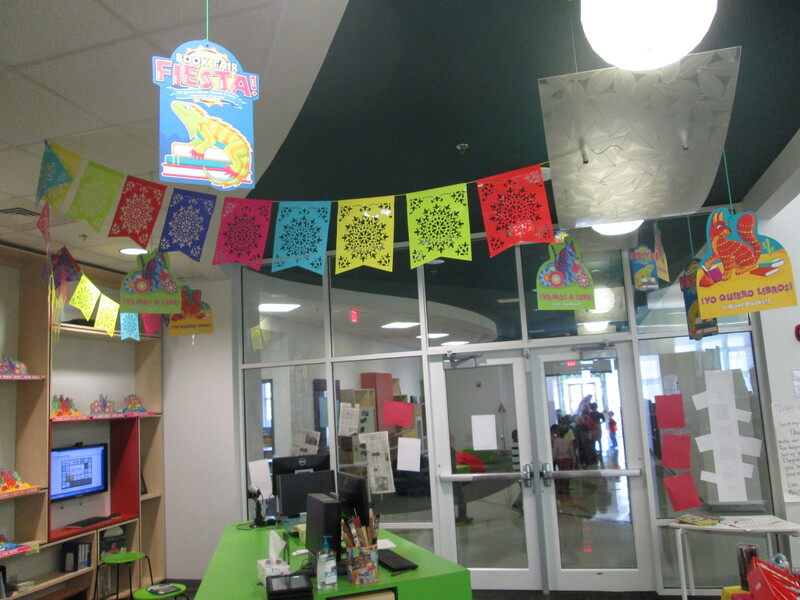 The circulation area becomes a space that gets decorated with the fair theme. 3. 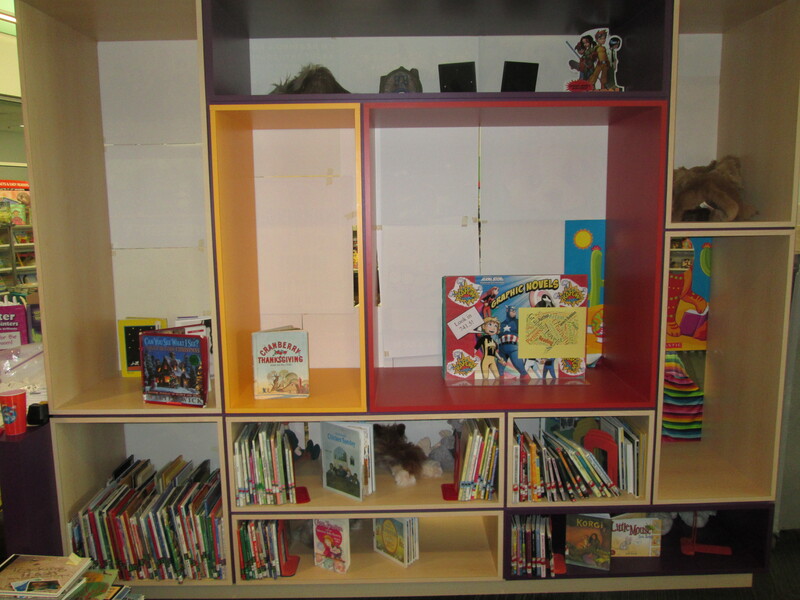 The purple counter with attached case becomes the dividing point for our library. Turn left and you enter the book fair. Turn right and you go to the books, computers, instructional space, and lots of cozy reading/working spots. 4. Inside the fair, our rolling Fusion Flip tables push together to create larger tables. 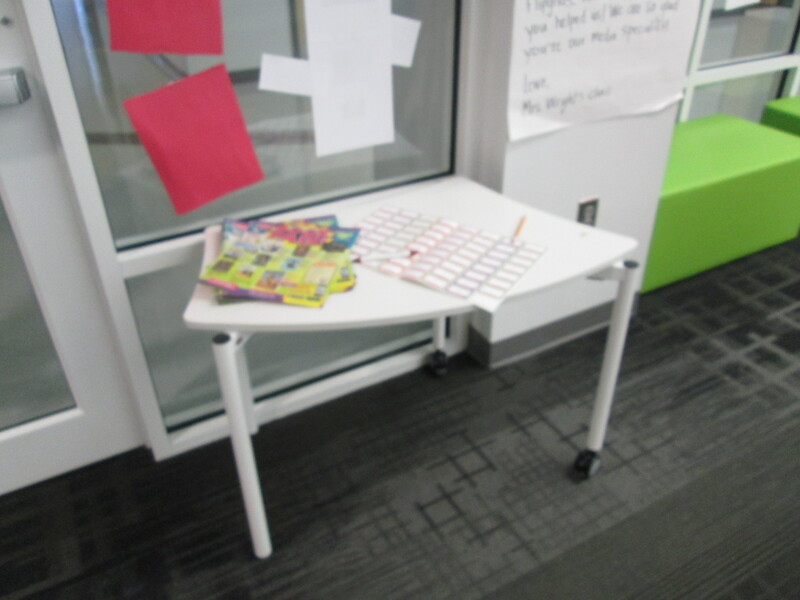 Our smaller student desk tables push together to make larger tables, too. 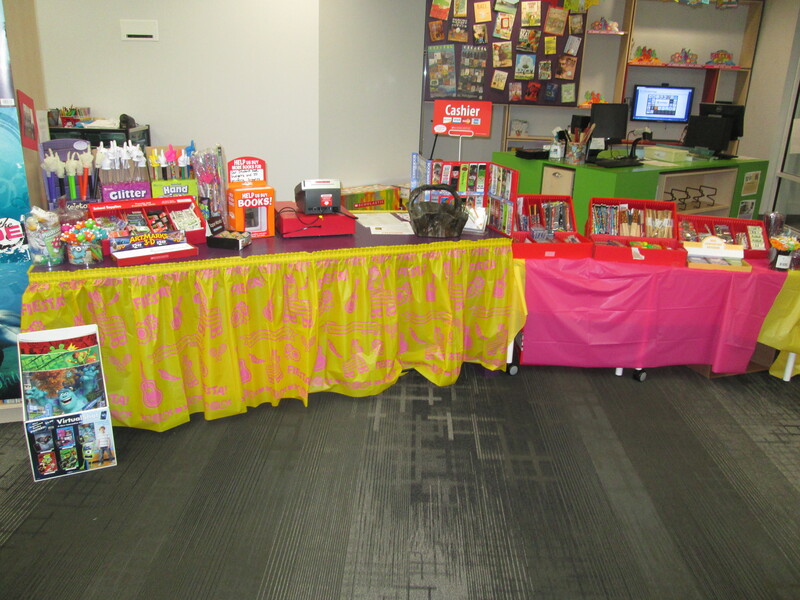 Single desks are used for things like our book plate and flyer display. 5. 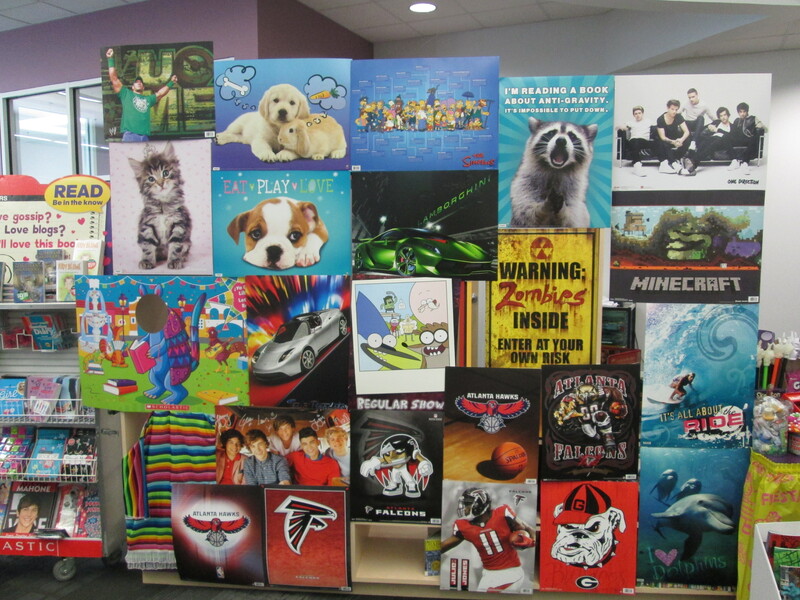 Our purple counter becomes the cashier station and the attached case makes a great place to display posters. The back of the case remains accessible to our graphic novels and holiday books. 6. Inside the fair, we leave a space to get to the equipment room and our ipad cart can easily be rolled out the side door to go to classes. We also leave a space to enter the room with the 3D printer and studio equipment. 7. Since pretty much every table in the library is used to display the fair, there are a lot of extra chairs. Those are all stacked in the corner, but not in the way at all. 8. The book fair is in the spot where our fiction and 2 iMac computers usually sit, so those have been moved to one of the 2 instructional areas of the library. 9. 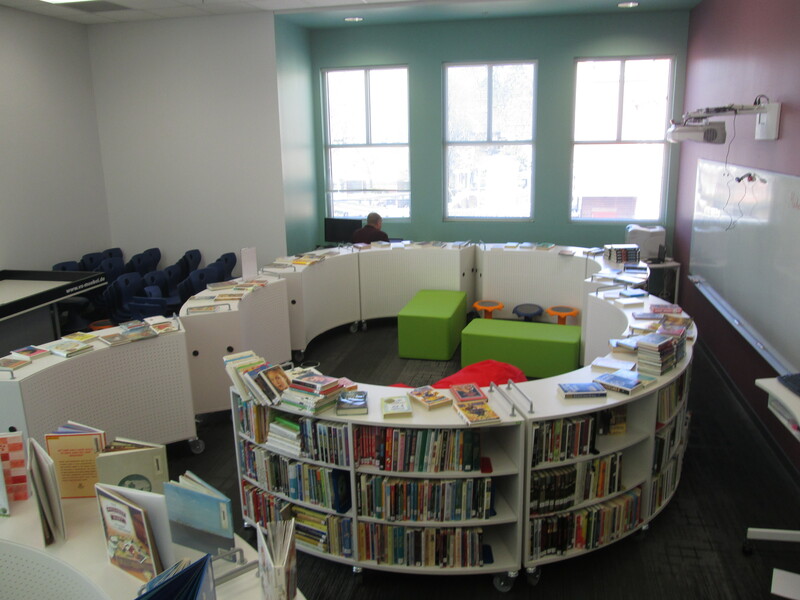 Some of the nonfiction shelving is circled up to create a little more space for large groups to sit in front of our projection area. 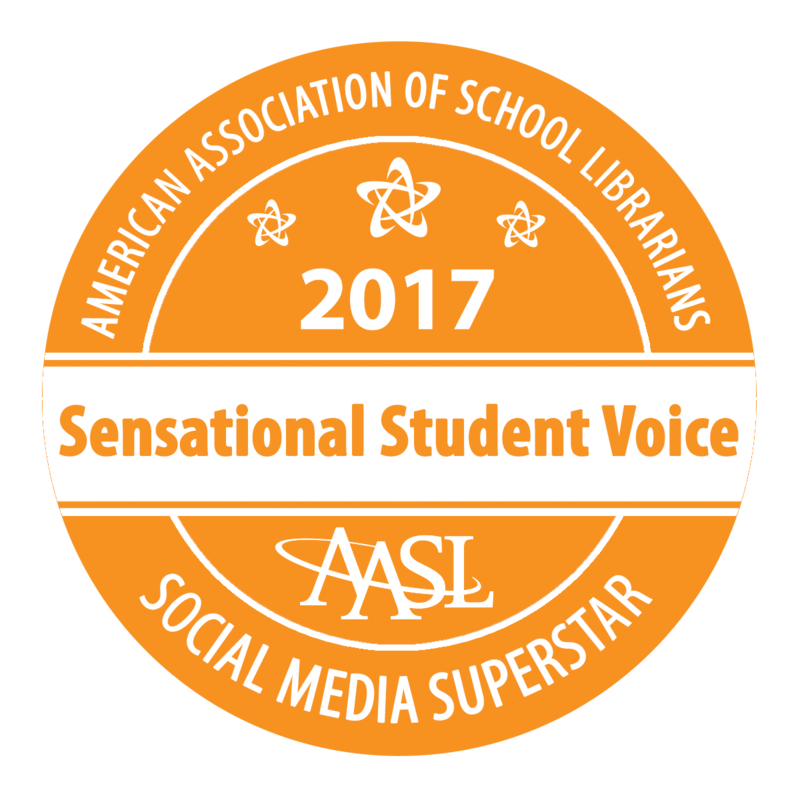 During book fair, we had an author visit with the entire 2nd grade and we will Skype with an author on Thursday as well. 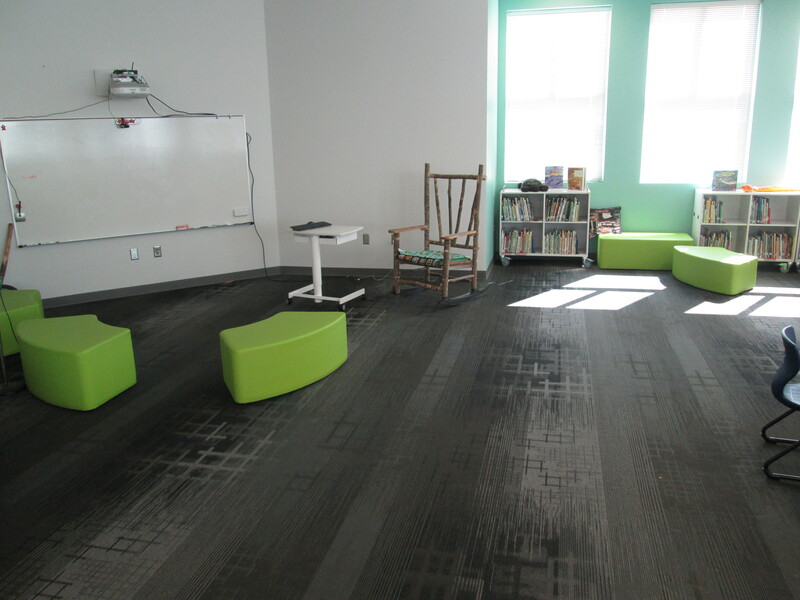 Some of our green cushions have been pulled over the projection area for small groups to sit and work with the projector. They get pushed out of the way for larger groups. 10. 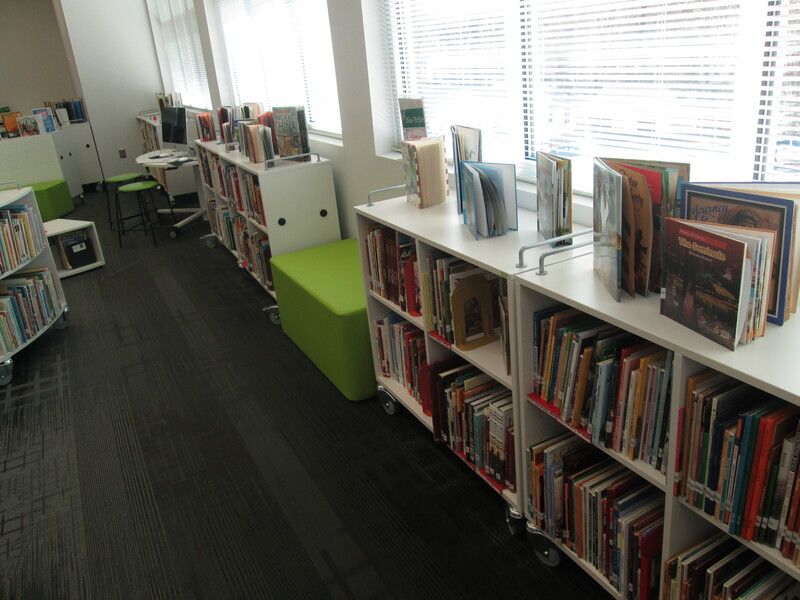 Our everybody picture book section and nonfiction are in their usual spots. 12. The book fair is completely closed in by the cases and the purple counter with case. 13. 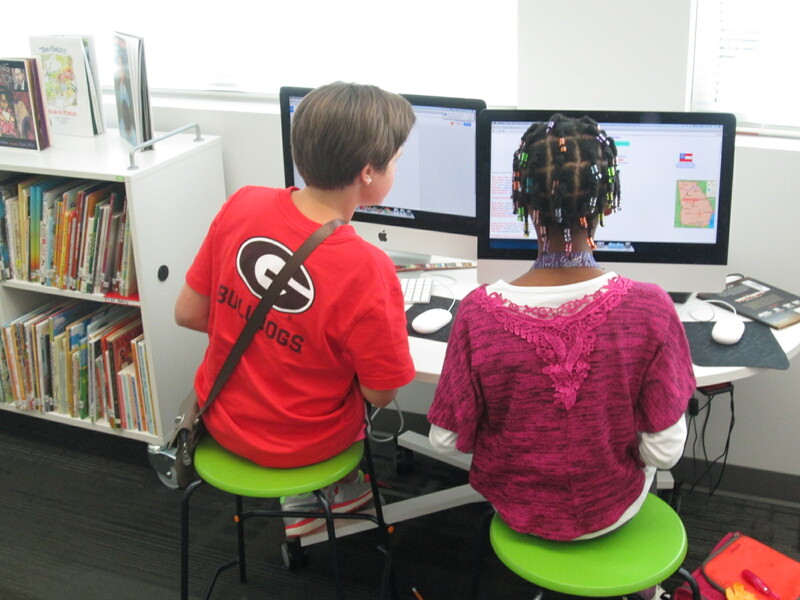 Even without tables, students use the remaining furniture to find places to work. Flexible was the most important word that we kept coming back to in designing the space. I wanted as few fixed pieces of furniture as possible. 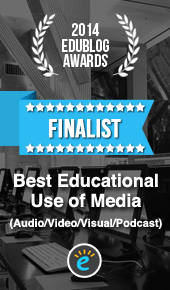 This maximizes our space and allows it to grow or change on a daily basis if needed. As we have progressed through the year, I’ve learned new ways of using and arranging the furniture each time I’ve moved it. I’m sure there are tons of possibilities that we haven’t even discovered yet. 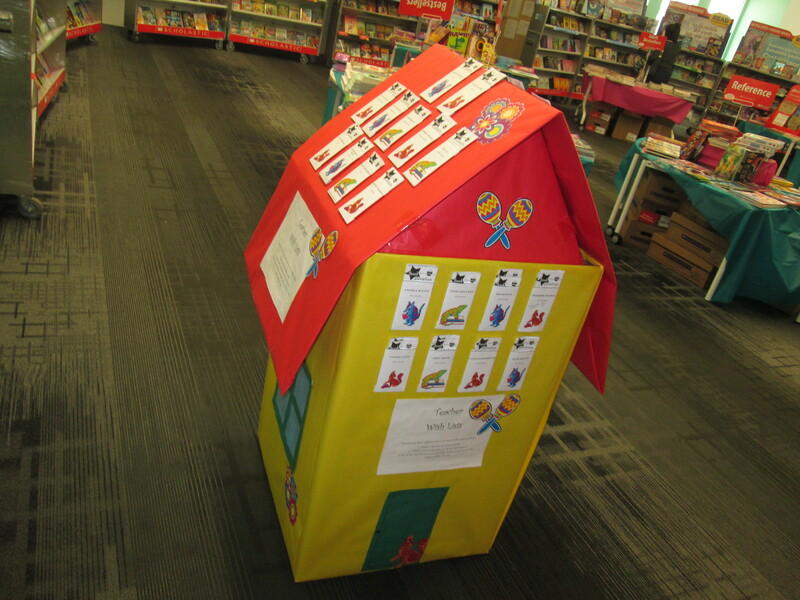 This entry was posted in Events and tagged book fair, flexible space, library design, moveable furniture. 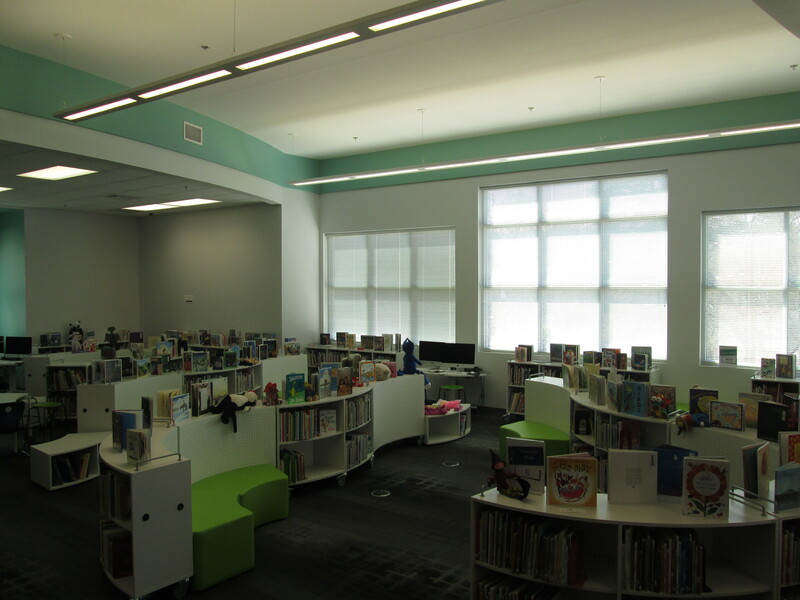 Hi, I’m a new library for an elementary school and I LOVE your set up! 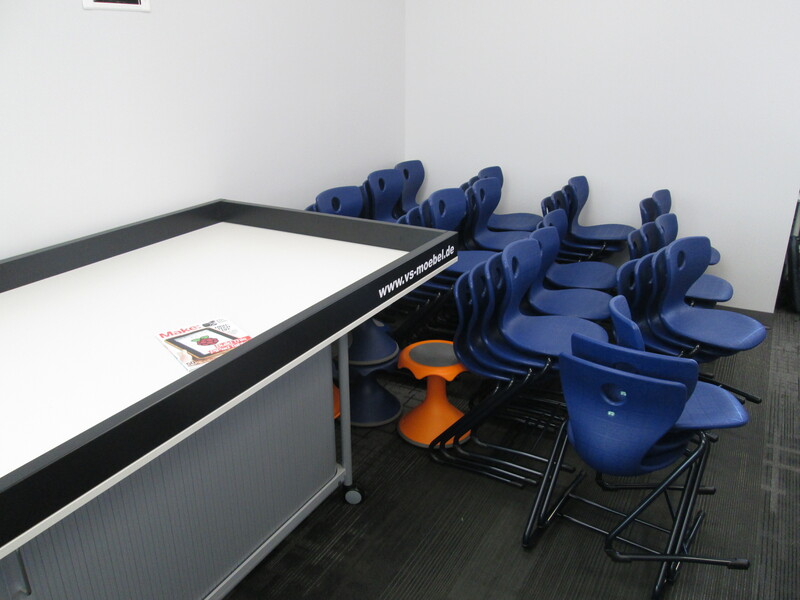 Can you tell me where you got those movable shelves and awesome multipurpose tables and desks? 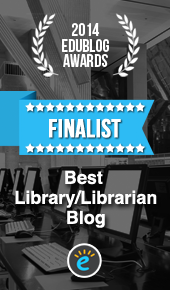 I have permission to transform this library and I’m chomping at the bit. Any help would be much appreciated. All of our shelving and tables came from VS America. 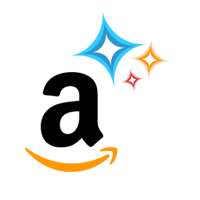 Good luck in your transformation. Hi, I am helping a school with updating their library and I love your circulation desk, could you tell me who the manufacture is for that piece? 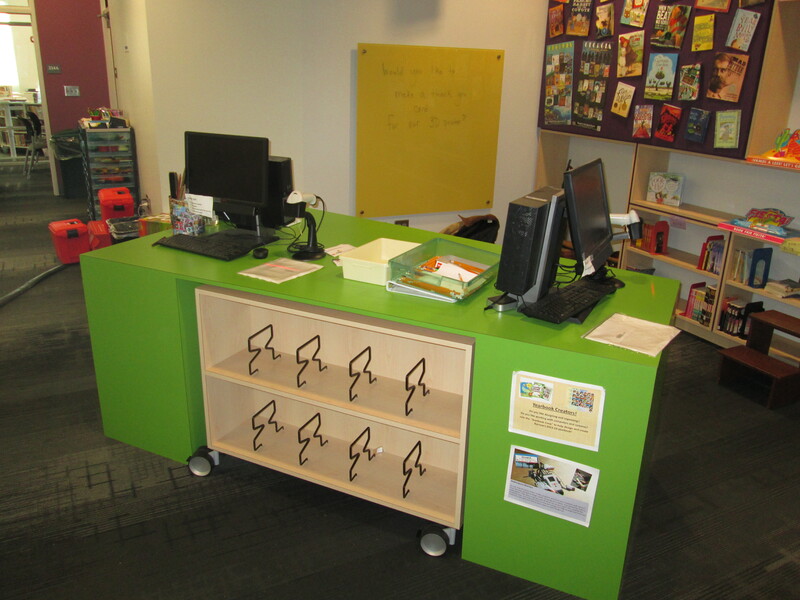 The circulation desk is custom built. Most furniture came from VS America, but the desk was made by a man in Macon, GA.